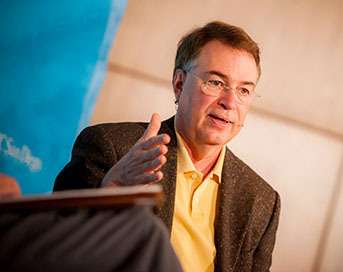 Larry Smarr, a UC San Diego physicist whose work on calculating black hole collisions ultimately led to the development of the first Web browser, was named Friday as the first 2014 recipient of the Golden Goose Award. The new award ward honors researchers whose federally funded research may not have seemed to have significant practical applications at the time it was conducted but has resulted in major economic or other benefits to society. Calit2 director Larry Smarr. Photo courtesy UC San Diego. The announcement was made in Chicago by Rep. Randy Hultgren (R-IL) during a symposium on the Golden Goose Award led by Rep. Jim Cooper (D-TN) and Hultgren at the annual meeting of the American Association for the Advancement of Science . Smarr is a professor of computer science and engineering at the University of California, San Diego, and Director of the California Institute for Telecommunications and Information Technology (Calit2), a partnership of UC San Diego and UC Irvine. At the University of Illinois at at Urbana-Champaign in the 1980s, Smarr was conducting gravitational physics research focused on computing the dynamics of black holes in space. The work, supported by the National Science Foundation (NSF), required enormous computing power, which at the time was not readily available to academic researchers in the United States. Smarr led the first proposal to NSF arguing for the creation of a national supercomputing center housed in an academic setting. This set off a revolution in computational science in academia and industry that continues today. Upon winning a peer-reviewed national competition underwritten by NSF, Smarr was named director of the National Center for Supercomputing Applications (NCSA), located at the University of Illinois at Urbana-Champaign. At NCSA he created a software development group to support the application needs of researchers. Two members of that NCSA team, Marc Andreessen and Eric Bina, created Mosaic, the world’s first widely-used graphical Web browser. The principal Web browsers of the past two decades, such as Netscape, Internet Explorer, and Firefox, are descendants of Mosaic, and today virtually every consumer computing device that accesses information, from smartphones to televisions, from tablets to automobiles, contains a graphical Web browser. Cooper first proposed the Golden Goose Award when the late Senator William Proxmire (D-WI) was issuing the Golden Fleece Award to target wasteful federal spending and often targeted peer-reviewed science because it sounded odd. Cooper believed such an award was needed to counter the false impression that odd-sounding research was not useful. Smarr will receive his award at the third annual Golden Goose Awards ceremony in Washington, DC, on Sept. 18, along with the other recipients to be announced later this year.